Origin Acoustics has announced upgraded versions of its Director Series in-ceiling speakers (shown here) and LCR in-wall speakers. The company has shaved up to two inches of depth off the three-way models in the Director Series, improved output sensitivity by an average of 3 dB, and developed a new smoother Ultra-Pivot mechanism for the tweeter and mid. Origin has also improved its patented Tool-Less Installation design. Read the press release below for more info. Origin Acoustics announces the availability and shipping of its newest generation of its most popular Director Series and LCR Collections of loudspeakers. After only two years into its lifecycle, Origin makes an unprecedented move and investment by releasing its second-generation series with a stream of advances certain to awaken the industry once more. The company's mantra of "Constantly Improve, Advance and Innovate" is witnessed here in full force. Make it sound better, make it look better and make it easier to install. Origins engineers have succeeded in all three areas. Certainly the most visible, if not one of most significant, advancements is that the Director three-way models have a shallower depth--as much as two inches is shaved off of the depth, making them fit into more ceiling spaces. Loud and clear! Through impedance and crossover refinements, the new series offers improved output sensitivity by an average of 3 dB. This dramatically decreases power requirements in large multi-room systems, making the Director more efficient and economical. Its new Ultra-Pivot Mids & Tweeters now reside in a smoother and more secure mechanism with the precise directional focus of critical mid and high frequencies. All models continue to feature the X-Wave Surround in the woofers. 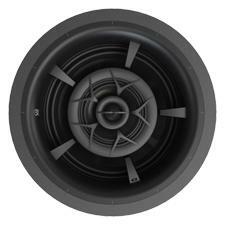 The X-Wave surround absorbs frequencies between 700 and 1,400 Hz that typically run up and down the cone of the woofer. The surround reduces unwanted distortion and improves driver stability while in motion. The reduced width of the surround also increases usable cone area. Every nuance of the new Director collection has been carefully considered to provide maximum sonic performance. The interior of the baffle has been fitted with a Variable Depth Absorption Layer or VDAL. This rubberized insert reduces resonances in the baffle structure while also eliminating mid and high frequency reflections that can negatively affect the pristine focus and clarity these speakers are capable of producing. The Director Series is the industry's largest matched-timbre in-ceiling line, from its smallest 3" to largest 10" model, with uniformity and matched materials on all five models. An advanced Industrial Design now includes new rubber material added to the baffle that further reduces unwanted reflections and delivers a total aesthetic "blackout" through the use of black aluminum and black Kevlar components. These design enhancements also give a more modern and intricate appearance. With Origin's Compression Molded Woofer Baskets utilizing the latest techniques, Origin is able to create basket designs with superior stability and acoustic neutrality. These baskets combine with the driver suspension to increase linearity and improve overall performance--every element of each product is improved. A paintable, perforated magnetic grille, with a micro bezel, covers the entire speaker assembly and leaves a discreet finished appearance. Its magnetic attachment makes removing or replacing the grille fast and easy. The grille magnets found on the Origin Acoustics Tool-Less Installation mounting rings are now enclosed in the plastic, sealing them away from exposure to moisture and temperature extremes. The revolutionary Tool-Less Installation (Patent #9591390) spreads the weight of the speaker over a larger area than typical mounting systems. Spring-loaded clips also create more uniform pressure against the drywall, eliminating any warping or distortion of the speaker baffle or the drywall itself. It is important when installing a loudspeaker in the ceiling that it be stable and secure, restricting the vibration of the assembly and limiting transfer of energy into the wall. "The new second-generation Directors Series and LCR Collection is the result of our continued obsession to innovate and improve by advancing every aspect of each system," said Nick Berry, executive vice president of Origin Acoustics. "No matter how colossal the advancement, the products' acoustic performance and installation ease for the installer are our top interests." The new model numbers, for simplicity, transitioned from even to odd number SKUs. The LCR Collection new models are the LCR69, LCR67 and LCR65. The Director 10" is the D109, the 8" is the D81 and 6" is the D65. • Visit the Origin Acoustics website for more product information. • Origin Acoustics Debuts AcoustaScape Landscape Audio Series at HomeTheaterReview.com.